Through good nutrition, WIC helps ensure optimal health outcomes for pregnant women, new mothers, and families with infants and young children. As Vermont’s premier public health nutrition program, WIC’s nutrition education, breastfeeding support, and healthy foods support thousands of women, infants and children every year to eat well, learn about good nutrition and stay healthy. WIC and health professionals work together to help Vermont’s families get the support they need during critical periods of growth and development, giving children the best possible start in life. Find out more about the many benefits of WIC, how to help families apply and learn about WIC's role in improving lifetime health for women, their infants, and young children. To support breastfeeding for the first year, the largest WIC food package is provided to mothers and babies who exclusively breastfeed. For mothers who combine breastfeeding with some formula or only use formula, WIC’s standard contract infant formulas are Similac Advance (milk-based) and Isomil (soy-based). Infants and children with qualifying medical conditions who need medical formula require a physician, physician’s assistant, or nurse practitioner to complete a WIC's Medical Documentation form for Infants and Children. A completed Medical documentation form is also needed for women who require WIC-eligible specialized nutrition products. Infants who require a medical formula will need medical documentation renewed every 6 months. A child or woman who requires medical formula will need medical documentation which can be written for as long as the product is needed. Children and women who require a medical formula are eligible for a full WIC food package, but will need medical documentation to receive WIC foods noted on their medical documentation form. Children age 12 – 24 months for whom a lower fat milk is appropriate can receive it from WIC with medical documentation. It can also be provided based on an individual nutritional assessment conducted by the WIC certifier to a family if the child’s weight for length falls at or above the 98th % on the WHO/CDC growth chart. Discuss their breastfeeding plans with their health care providers at every visit. Learn about hospital practices important for breastfeeding and share their infant feeding plan with hospital staff. Accept referrals to community lactation experts. WIC is committed to helping mothers meet their personal breastfeeding goals. We provide moms with targeted education, healthy foods, support from WIC breastfeeding peer counselors, prenatal and early post-partum breastfeeding classes, breast pumps for returning to work or school, and more. WIC can also provide health professionals with patient and staff breastfeeding resources. Contact the local WIC office in your area to receive breastfeeding resources for your practice, and to learn more about how you can partner with WIC to strengthen support for breastfeeding families. Learn more about Breastfeeding and WIC's Mother/Baby breastfeeding support on the WIC Works – Special Project Grants website or by contacting WIC@Vermont.gov. The Vermont Department of Health provides a variety of best practice guidelines and toolkits for health professionals, including guidelines for promoting healthy weight in adults and children, and guidelines for preventive primary care. WIC helps families meet the Physical Activity Guidelines for Americans. Fit WIC resources help increase active physical activity for two, three and four year olds. WIC promotes the role of parents as their child's first and most important teacher and provides an Activity Book to guide both unstructured and structured playtime. Fit WIC also provides information on the relationship between cognitive and physical development, ideas for incorporating physical activity into everyday routines, and specific skill-building activities designed to enhance physical development and learning. You can view the Fit WIC Activity Book and order copies to share with your patients. Contact WIC@Vermont.gov or your Local Health Office. An annual State Plan of Program Operations and Administration for the WIC is submitted to the US Department of Agriculture, Food and Nutrition Service for approval of program operations. The most recent State Plan for Federal Fiscal Year 2017, October 1, 2016-September 30, 2017, and a report on 2016 activities, provides goals, objectives, and activities for: vendor management, nutrition services, information systems, organization and management, nutrition services and administration expenditures, food funds management, caseload management, certification, eligibility and coordination of services, food delivery/food instrument accountability and control, monitoring and audits, and civil rights. To read and provide feedback on the WIC State Plan or for more information, please contact: WIC@vermont.gov. WIC Works is a national online resource for health and nutrition professionals working with families participating in WIC. WIC Works includes professional training modules, state developed educational materials for families and a database of WIC-eligible formula. The hospital stay is a critical period for establishing maternal confidence in breastfeeding and laying the physiological foundation for breastfeeding success. By six months, only one in four mothers are still exclusively breastfeeding their babies. Many mothers stop breastfeeding before they are ready, citing reasons related to their experiences in the hospital. 90% of Vermont mothers start to breastfeed in the hospital. Preventing childhood obesity and promoting lifelong health begins with breastfeeding. Breastfeeding for at least six months decreases a baby’s odds of becoming overweight by more than 30 percent. Hospital policies, procedures and staff can influence mothers and babies as they begin to breastfeed, and can affect long term and exclusive breastfeeding. To facilitate a quality improvement initiative focused on evidence-based maternity care practices, the Vermont Department of Health’s Special Supplemental Nutrition Program for Women, Infants and Children (WIC) partnered with the Vermont Chapter of the American Academy of Pediatrics, the Academy of Family Physicians, and the Vermont Child Health Improvement Program (VCHIP). Ten of the 12 hospitals with birthing centers joined the project to address prioritized individual and collective goals. Assist with initiation of skin-to-skin and breastfeeding within 1 hour of birth. With permission from the California Department of Public Health, Vermont updated the Birth and Beyond California (BBC) 16-hour training curriculum, provided training for staff from participating hospitals in Vermont, and supported those hospitals to deliver future trainings to their staff. BBC’s training provided an opportunity to teach best practices to support early maternal-infant bonding through skin-to-skin contact for all mothers and babies, and delivered new knowledge and skills to promote, protect, and support a mother’s decision to breastfeed. 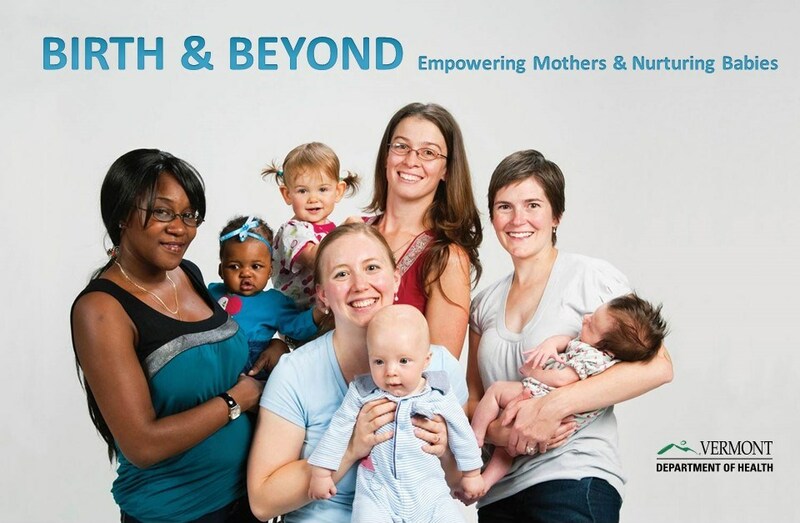 Vermont’s Birth and Beyond: Empowering Mothers and Nurturing Babies built on the BBC training with a focus on “The Ten Steps to Successful Breastfeeding,” and added new content to fulfill training objectives for the “Baby-Friendly Hospital Initiative”. The training materials are available to other states to further hospital focused trainings for maternity care staff. Training resources can be used to train new or existing staff, in groups or as self-study modules. The Birth and Beyond VT: 10 Steps to Empower Mothers and Nurture Babies presentation “platform” uses an innovative design approach that allows trainers to present the training curriculum in a highly-visual, easy-to-navigate format. All components of the platform – photo slides, picture stories, video clips, and resources are linked together through hyperlinks in a single platform. This approach is designed to enhance learning through triggers from photo images, picture stories, video, and audio to achieve desired objectives. The platform allows presenters to quickly and easily move throughout the presentation to respond to specific questions, access videos and other resources. Trainers should become very familiar with the detailed speaker notes before using the presentation platform to train. The speaker notes provide brief key messages for each visual in the platform, along with reminders and navigation options. NOTE: Windows XP may work, depending on your computer. Software: Microsoft Office Suite© 2007, 2010, 2013 or 2016, which includes PowerPoint. NOTE: The presentation platform will not run on PowerPoint 2003. Some embedded video may not play in PowerPoint 2007. Ability to play “WMV” video. LCD (Liquid crystal display) projector to display PowerPoint. Computer speakers or audio sound system. “Air mouse” (preferred) with motion-sensing technology that allows a presenter to control the presentation anywhere in a room, with the mouse held in the air or on a solid surface (or standard wireless or wired external computer mouse that uses optic sensing and requires a surface). To access web resources during the presentation, an online connection must be established. These training materials were developed by the Vermont Department of Health for the use of individuals who are authorized to view its contents. The intent of these training materials is to provide lactation education and training to providers of maternal and child care. By accessing these materials, you agree that the materials will be used only for the above stated intent. Any copying or distribution other than in this context is prohibited without the department’s express written consent. The Birth and Beyond California (BBC) Project utilizes Quality Improvement (QI) methods and training to implement evidence-based policies and practices that support breastfeeding within the maternity care setting. The BBC Curriculum was developed as a result of collaboration among the Maternal, Child and Adolescent Health Division of the California Department of Public Health, and its many local organizations and individuals. Utilizing the Regional Perinatal Programs of California, this project provided participating hospitals with ongoing quality improvement (QI) technical assistance, resource development and on-site education and training. The training curriculum was adapted from the successful SOFT Hospital, a project developed by the Perinatal Services Network at Loma Linda University under the leadership of Carol Melcher.